Travelling with kids to the city? Reading a book about a city? Learning about or teaching kids about geography or communities? This City Play Dough Mat is a supplement that can help with more skills than just adding to a city learning theme, all in a fun play dough activity! This free play dough mat has a city theme and a special component that boosts fine motor skills specifically hand strength, and the intrinsic muscles of the hands. 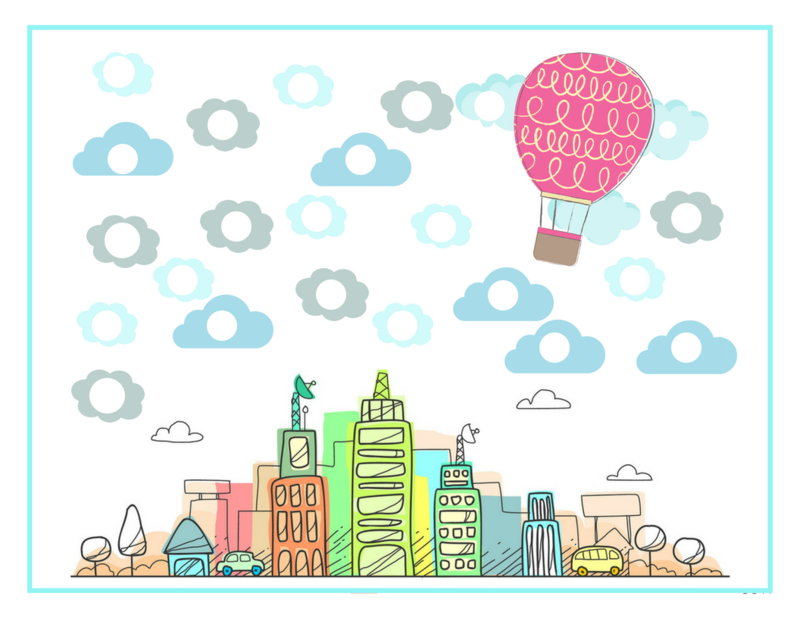 Print off this city playdough mat and start playing and learning WHILE boosting those skills that kids need! 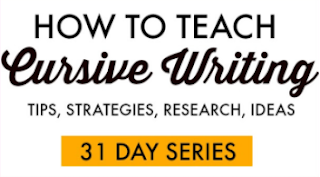 I love adding hands-on components to learning themes. It adds a special twist that really helps with recall when motor components are added. This city play dough mat is a great accompaniment to any community or geography theme. Kids can fill in the circles in the city skyline while building the fine motor skills they need for tasks such as endurance with writing or coloring, pencil control when forming letters, functional pencil grasp, management of buttons/zippers/other clothing fasteners, opening and closing of food containers, and so many other fine motor tasks! For the child who struggles with fine motor skills or has a fine motor delay, this city play dough mat can be a fun way to build those skills. 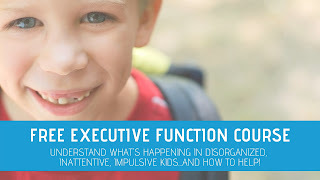 In fact, there are so many fine motor skills needed in school environments whether it occurs in the classroom or homeschool dining room. 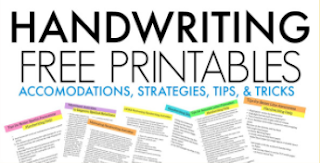 Building fine motor skills can make an impactful difference in learning and functional tasks! Play dough mats are everywhere! 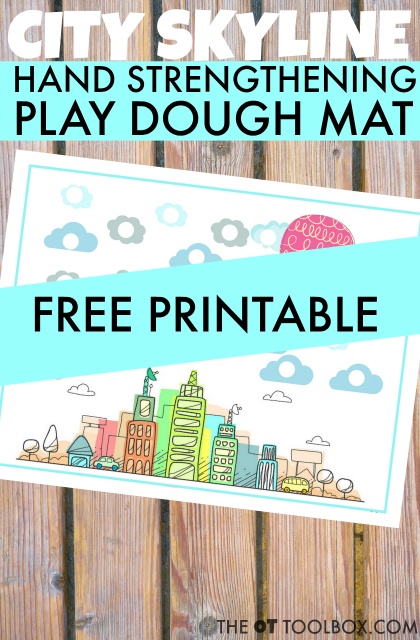 Do a quick Google search and you will come up with tons of options for free printable playdough mats that kids can use. The thing is, though that just the act of playing with play dough on a play dough mat is a really power tool in strengthening little hands! In fact, there are so many ways to use a play dough mat to strengthen the skills kids need for fine motor tasks. One of the ways we have been focusing on here on The OT Toolbox with our recent play dough mat series is working the intrinsic muscles of the hands by rolling small balls of play dough in various sizes. Using the finger tips and thumb of one hand at a time to roll a play dough ball is an intrinsic muscle workout that builds the muscles of the thenar eminence, hypothenar eminence, the interossei, and the lumbricals. All of these muscle groups make up the intrinsic hand muscles which are those located within the hands. The intrinsic muscles are those responsible for nice, defined arches of the hands, the ability to separate the two sides of the hand, and to have nice, bulky muscle tone in the mass that makes up the base of the thumb and the side of the pinkie finger. These muscle groups help with dexterity, endurance, coordination, and controlled manipulation of small items and all things fine motor! Use this Free Play Dough Mat with a City Theme in fine motor play! Grab a copy of this free playdough mat by entering your email in the form below. 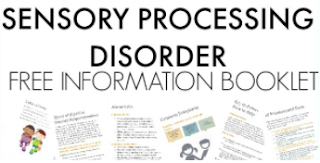 You will receive the printable play dough mat in your email where you can download it and use it over and over again in your therapy toolbox. You'll also receive a couple of emails over the next week or so that provide resources and tools for increasing hand strength with play dough, along with all of the other free play dough mats we've shared here on the site. You'll definitely want to get in on this email action! Grab this FREE printable City Themed play dough mat to help kids strengthen the intrinsic muscles of the hands! Want to check out the other play dough mats we've shared recently? They are all designed to promote strengthening of the intrinsics and hand strength in kids! Here's the thing, though...you only need to enter your email into one of these pages listed below. As a subscriber, you get access to all of the free play dough mats. 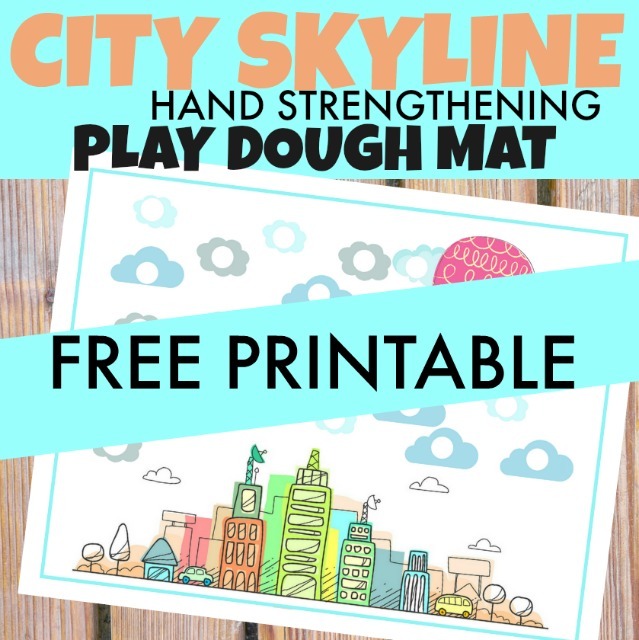 Be sure to grab the city play dough mat and use it for increasing hand strength in fun ways!